The Town of Franklin, NC receives many requests to reserve Memorial Park and the Gazebo on the Square for special events. Some events require street closures. All street closings must be presented to the Town Council for approval. All requests must be submitted to the Town Manager one week prior to the scheduled Town Council meeting. The Franklin Town Council meets the first Monday of each month at 7:00 p.m. in the Town Hall Boardroom located at 95 East Main Street, Franklin, NC 28734. Late May through Mid October - Pickin' on the Square returns to Downtown Franklin. This free event is held each Saturday Night (weather permitting) and features live entertainment each week. Bring your lawn chair for a great evening of family entertainment during Pickin' on the Square. Come early and enjoy one of our great restaurants. Food vendors also available. 2019 Schedule will be announced in the coming months. 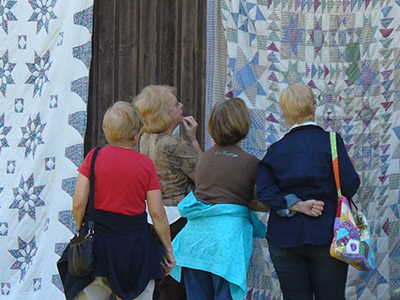 Sponsored by over 30 Downtown Franklin, North Carolina Merchants the Airing of the Quilts is an outdoor quilt show that showcases this timeless piece of our Appalachian heritage. See quilts displayed all throughout Historic Downtown Franklin as businesses and homeowners will be hanging quilts from their store fronts and porches that will create an unbelievable burst of spring color throughout the Town of Franklin, NC. A day of Scottish Fun, Food, Fashion, Music, Highland Games, Clans, Border Collie Demonstrations, Crafters, Cherokee and Re-enactor Demonstrations, Seminars, and Culture for the whole family! Other events are planned around the festival as well and can you learn more by clicking the link below. 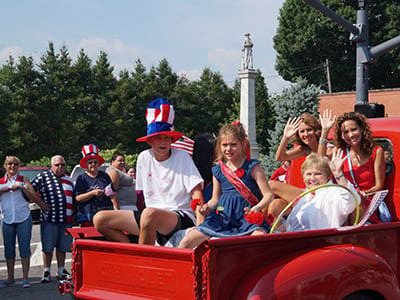 Franklin's Annual Independence Day Celebration begins with our annual 4th of July Parade at 10:00am. While you go most places to see a parade, we actually invite you to participate! Deck out in red, white and blue and walk or drive down Main Street. NO REGISTRATION IS REQUIRED. To join in, just be in the lower level of Franklin Town Hall for lineup beginning at 9:30 am. The event also features contests for kids and much more! NEW this year is the Dialed Action Bicycle Stunt Show featuring 3 stunt riders on a 120' course along Main Street. The show gets underway at 11:00am and is sure to be blast for the entire family to see! 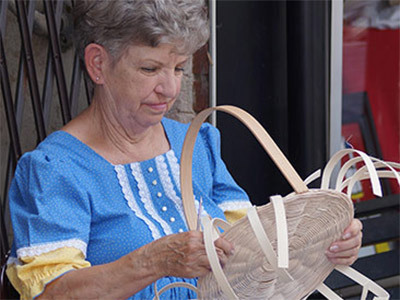 Sponsored by over 30 Downtown Franklin, North Carolina Merchants .... the Appalachian Heritage Festival brings a day of free fun for all ages on Saturday, July 20, 2019! Nearly 50 live demonstrations will be showcased and will feature the essence of life in Appalachia. You'll see quilters, wood carvers, canoe builders and even a live, working gem mining flume. They will all be setup on the sidewalks and in front of businesses giving everyone easy access to them. Many other events are planned as well. Plus with it being a celebration of Appalachia, you'll be hearing a lot of music from guitar to dulcimer, banjo and more! Get ready to let the good times roll during Franklin, North Carolina's 23rd Annual PumpkinFest! This street festival and celebration of Autumn is pure familiy fun! Children and adults alike will have a blast taking part in traditional and some very non-traditional fall festivities during Western North Carolina's premier autumn festival. PumpkinFest rolls into action on Saturday, October 19th and Historic Downtown Franklin, North Carolina is full tilt with everything pumpkin. Bring your pumpkin (or purchase one downtown) and sign up early for the World Famous Pumpkin Roll. The Costume Parade and Contest is another highlight of the day as well as the Pumpkin Pie Eating Contest. And don't miss out on more than 80 vendors including mountain arts & crafts along with great food! There is always live entertainment including roving street performers. PumpkinFest runs from 9am to 4pm and is held rain or shine. Join the Town of Franklin as we, along with our citizens, honor Veterans on Monday, November 11th with a parade & ceremony. Once again in 2019 featuring the award winning FHS Marching Panther Regiment. The parade will leave the lower level of Franklin Town Hall at 10:30 am and travel to the Gazebo on the Square for the ceremony. 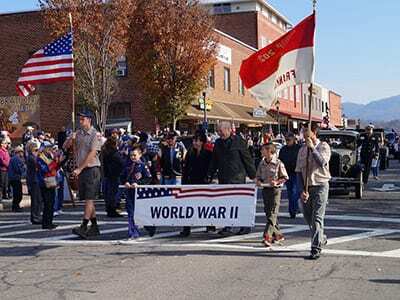 Special banners, carried by the Boy Scouts, lead each group of Veterans along the parade route according to the war or time period of service. Lineup for the parade begins at 10:00am for Veterans that wish to participate. The Veterans Ceremony begins at 11:00am and is always very moving. It features a guest speaker along with a wreath laying ceremony and the playing of Taps. Come, bring the entire family and show your appreciation of these men and women who have served. We also encourage you to show your patriotic pride by dressing in red, white and blue! join with us for this most wonderful time of year as Historic Downtown Franklin is transformed into a "Winter Wonderland" featuring: living window displays of Christmas & the Holidays, live sounds of the season outdoors at the downtown gazebo and inside stores, FREE carriage rides, miniature train rides, wagon rides (weather permitting), refreshments, hot cider, great sales from downtown merchants and much more! 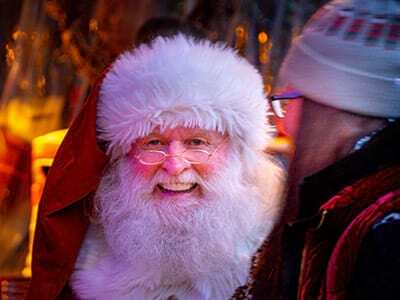 You can also meet and take your photo with Santa! Winter Wonderland coincides with Small Business Saturday® founded by American Express®. Plus, we will hold our Annual Tree Lighting Ceremony at 7:00pm on the Square! Remember, our Downtown Merchants are open late during Winter Wonderland with great gift ideas for everyone on your shopping list! Winter Wonderland is held rain or shine. Schedule subject to change. You'll find there's no holiday quite like a mountain holiday in Franklin, NC , so bring the family and enjoy all the music, lights, fun and holiday cheer during night two of Winter Wonderland in Historic Franklin, North Carolina. 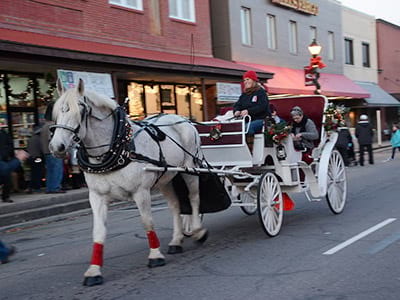 Enjoy FREE carriage rides in an elegant vis-s-vis carriage drawn by a white Percheron over 18 hands tall. Also enjoy FREE wagon rides and miniature train rides. Santa will also be there! Winter Wonderland is held rain or shine but subject to snow.